Home » franken » glitter » green » holographic » nail art » Happy Halloween! I did this a few weeks ago for fun and forgot to post it. It's kind of weird and random! My blogger wasn't working earlier so sorry for the late last minute post. We get zero trick or treaters at our house so it was a nice quiet night for us. 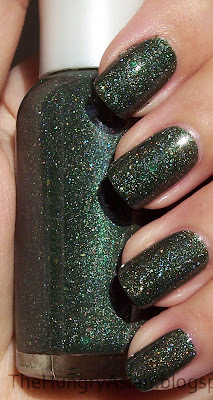 The franken Grace gave me, it's a dark mossy green with holographic glitter and some other flakies in it. I love it! She also said that I can name it, so I think I will call this one Gracefully Yours. Yea we only had a total of 2 knocks. I really like these! The tombstone is my favorite. I love that franken and that mani, so cute! 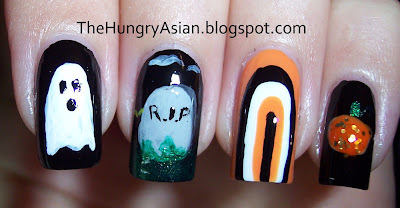 thats a great hallow mani...love the franken..
Heehee your Halloween mani is cute! I love the little ghostie ^_^ Gracefully Yours is a lovely name for a lovely polish. I love the tombstone and the ghost! I love the franken! Very cute halloween mani too. What a beautiful franken, looks so nice on you! My hubby said that we had plenty trick or treaters. IDK b/c I walked with our 2 boys through the neighborhood and there were plenty people out. I like the franken and its name. Very cute! I didn't get any trick'o'treaters too! That franken is like nothing else I've ever seen - it's really amazing! Cute Halloween mani! That's just darling! I'm loving this franken holo. Beautiful color. Love your Halloween manicure. We had about 30+kids. That's way down. I live in an apartment complex so I usually get hit hard. I can't believe that there weren't that many kids. The weather was warm and it was a Saturday. If I was young I would've been out at noon and kept going till I had a big full bag. Love that franken. It's really beautiful and so is the name you gave it.